We have been engaged in translational scholarship—under the umbrella of “knowledge translation” for some time, interested in its philosophic underpinnings on the one hand and its practice orientation on the other. 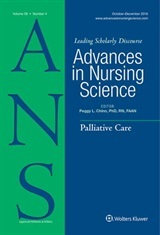 The two papers in the ANS 38:3 issue were developed in the context of a research-practice collaborative in British Columbia (iPANEL) that shares a common goal of advancing the further integration of a palliative approach into the healthcare system. 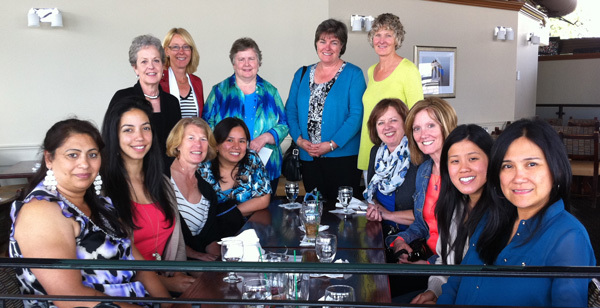 We are indebted to the many nurses engaged in this initiative as investigators, clinicians, and affiliates and to Michael Smith Foundation for Health Research (MSFHR) for their generous funding. Within the knowledge translation (KT) literature how to actually do interactive and integrative KT has been identified as the primary question researchers are currently facing. It has become increasingly clear that something beyond instrumental, prescriptive approaches that arise out of externally-driven knowledge concerns, and impose directives for evidenced-based ‘best’ practice are needed to affect meaningful change at the practice level. As we have conducted our various KT research projects and pondered possibilities, three key insights that offer a different KT approach (at the conceptual and practical level) have emerged. First, we have come to see the fundamental importance of KT being an inquiry process. Taking an inquiry approach involves working between the existing (what is known) and the emergent (what is not fully known and/or what might be needed). Structuring KT as a process of inquiry and working ‘in-between’ what is known/not known focuses attention on the specific features of a situation and highlights that the question “How best to proceed?” can only be answered within those particularities. Typically KT is focused toward ‘filling a knowledge gap.’ It is assumed that ‘the problem’ is one of knowledge—people simply lack the latest research knowledge. However, that assumption has not held up in our research. As we describe in our papers, even when the latest research evidence is known there may still be a gap between the care that should be provided and the care that is offered. Subsequently a second insight we propose is that KT is not about filling a gap as much as working in the gap—the gap between the real and the ideal, between realities and possibilities— and seeing that practice gap as a fruitful site for the development of knowledge and practice capacity. It is this gap between real and ideal practice that is of utmost concern to patients, nurses and other health practitioners and that serves as the greatest impetus for practice change. Orienting KT toward a shared practice concern (i.e., the gap between real and ideal care) serves to align practitioners’ deeply felt concerns with their capacity to address those concerns. Moreover, it enables practice concerns to be heard and shared and knowledge to be enlisted to effect change. It also democratizes the knowledge process and knowledge milieu, fostering inclusivity and responsiveness to multiple forms of knowledge. Finally our third insight is the importance of having a KT process in which nurses and other health practitioners play a central role. 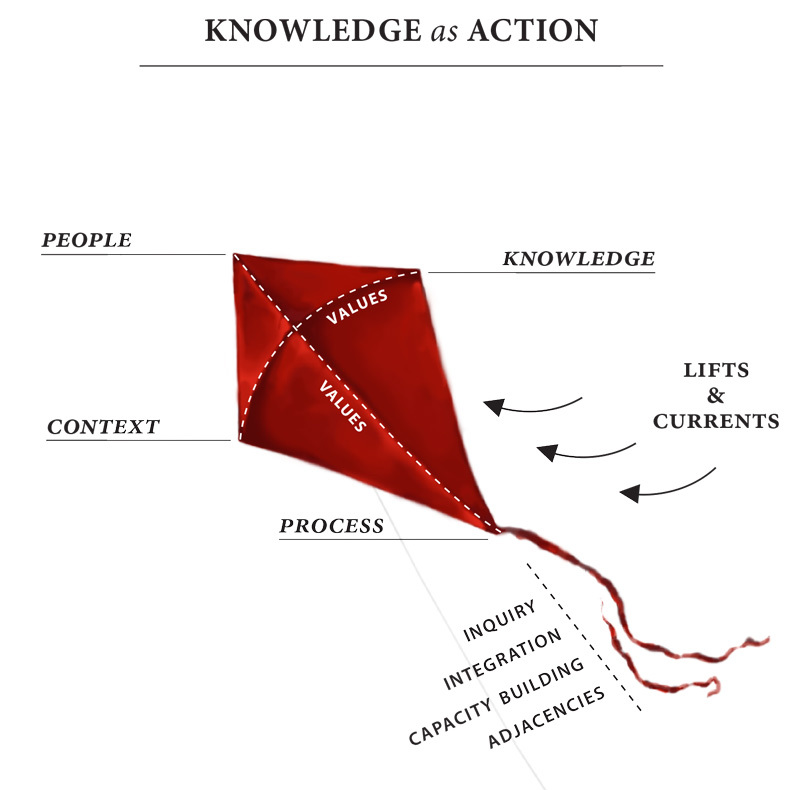 And this is where the KITE heuristic, the Knowledge-AS-Action Framework (see Figure below), that we describe in our papers comes in. If the goal of KT is to have the most up-to-date knowledge inform and reshape practice, is it not the practitioners who need to be supported to take the active and central role of determining the relevance and usability of any research knowledge—and, moreover, of determining the direction of the KT process itself? The KITE heuristic opens the space for practitioners to put their own expertise to work. At the same time the heuristic structure serves to identify the multiple forms of knowledge that exist, the further knowledge that might be needed as well as directions for action. The heuristic by its very nature provides an integrated way of thinking about practice development and change that is grounded in explicit and shared values and goals. While our papers discuss the use of the KITE heuristic in integrating a palliative approach into nursing practice, we believe the heuristic may have utility across a range of practice contexts and concerns. As part of the blog discussion we invite you to consider that possibility and respond to what we have proposed—even consider trying out the heuristic in your area of nursing practice and/or with a current concern. We look forward to hearing your thoughts and experiences. Indeed, these two articles provide compelling insights and possibilities for practice in many clinical situations. I hope you will visit the ANS web site, download these articles while they are featured, and then return here to add your responses and ideas!